I’m pleased to have recently finished this commissioned mosaic. 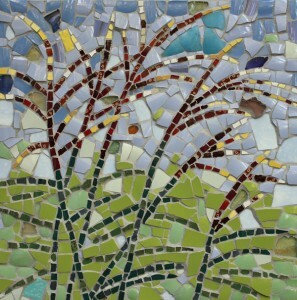 The theme is prairie grasses, and the piece is 12″ x 12″. I used recovered dishes and pottery to make the piece. When I make mosaics, I use a tile nipper to shape the ceramic pieces to fit, then glue them to a plywood backing before applying the grout.